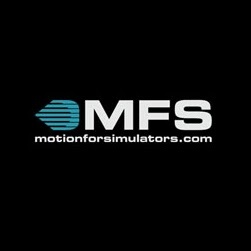 We would like to congratulate the team from Motion for Simulators for an outstanding job done on our full motion simulator, a new motion software was installed and fine tuned by Marnix and Xavier, now is the time to extend our gratitude for great customer support and dedication. Fantastic News Sam. Credit where Credit is due and I am very glad you managed to get that sorted out. Thanks for the support guys! Well Done! THANK YOU TREVOR, VERY HAPPY!!! That looks MUCH smoother than the old configuration! Glad to know you've got it all worked out now! Yes is way smoother and the response is more precise, the old configuration was based on a two way communications basis clogging the com traffic and disconnecting for a brief second, now is one way from the unit to PC, don't ask me how it works, but that's what I was told, also the IP on the main computer had to be changed to a odd number, I had .20 before and now is .11, go figure but all the issues was related to the IP and the communication setup, with a new software and an updated config file it works like a dream, there is a few other bugs to fix but minors, like on initial connect you feel it and on disconnect too but they are working on an update to correct it. If I remember well, Marnix and Xavier did the original setup. Is it their new software or are they with a new company? Yes, they were with us at FDS and did the initial setup, still the same company, doing better than ever and they have improved their motion software big time, I was impressed. When I added the instructor station, the initial set up started to malfunction and it's been a roller coaster ride since then, something to do with the back been too heavy, back in January 2014 I unbolted the cockpit from the platform and realign the CG To distribute the weight evenly, after that the platform worked good again but it had intermittent connection issues. Last November I mention it to Marnix and he offered to come over in February and install their new software and tweak it, to my surprise they not only installed the new software, they also redesigned the way it communicates with the main PC, the results are spectacular. Page created in 5.412 seconds with 28 queries.